Summer was just around the corner; itch for one last adventure weekend for the season prompted us to pack off to Dandeli. Holidays are more exciting when there is a certain amount of travel comfort so mode of transport is a very critical part to any holiday plan. Given that Dandeli is nearly 482 kms from Bangalore and since our weekend was going to be filled with Adventure and a lot of Physical exertion, we opted for a train journey, in Kollapur bound Rani Chennamma Express that stops at Alnawar, which is around 40 kms from our destination. So we set off to Dandeli from the Bangalore railway station at around 8 pm on a Friday evening, to reach Alnawar Station at around 6.30 am the next morning. Post which, we hired a Tempo Trax. Enroute to Kulgi Nature camp, our campsite, we spotted Peacocks, Deer and quite a variety of birds; it was indeed a treat to see them all in the wild. Kulgi Nature camp is managed by the Karnataka Forest department and offers a comfortable tented accommodation with common toilets, bath and hot water facility too. The camp has an in-house kitchen that serves tasty authentic North Karnataka cuisine. As the Camp is in the forest area we could spot Langoors all around, Malabar giant squirrels and Birds like Minivets, Dorangos, Blue Jays, Bee Eaters, Kingfishers and other common ones. 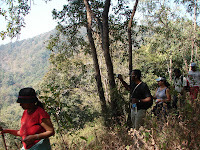 After freshening up, a good heavy break-fast and packed lunch, with rest of the necessary stuff in our backpacks; we set off on a day long trek, accompanied by a guide provided by the forest department. The route we choose was to end Ambikanagar via Nagazari bridge approximately about 15 kms. We trekked through the amazing forest range, along the banks of a stream, up the hills and the water falls, we could not get enough of it. We took a quick lunch break; with all the exertion the lunch had never tasted better. As the minutes passed by it was getting darker and colder but our enthusiasm and the sprit of adventure pushed us every step. We reached the end of the day long trek, and in less than an hour from there we were back in the camp, a long shower and a good dinner put us to bed within no time. Early morning is the right time to spot wildlife, so we hopped into the jeeps for a safari at around 6 am. One needs to be patient and lucky enough to spot animals in the wild; it did not deter our enthusiasm to give it a try. Though spotting an elephant or a wild cat would have been an ultimate thrill, we were happy to see few Deer a Bison and several species of birds. The Jeep track took us deeper into the jungle, where the forest cover got thicker and darker. We went ahead, hoping to spot that one wild cat that could make our day. After that desperate attempt to see more wildlife we got back to the camp to grab some breakfast and ready to splash some water in River Kali. We reached Jungle Lodges and from there were driven in jeeps with the rafting guide team to Ganeshgudi, the starting point for our activity. Rafting in Kali is a real pleasure as the name suggests the water appears to be black due to the coloration of the rock under. No comparison to rafting in Rishkesh, in terms of distance or the grades of the rapids but never the less Kali has its own charm, thrills and is a lot fun. The activity started with a talk on safety, wearing the life jackets and other gear. Once on the raft we were taught how to paddle and when to paddle followed by a dip in Kali. The 9 km route has 7-9 rapids between 1-3 grades. The rapids depend on the release of the water from the dam. Kali being a perennial river has water throughout the year, but the best time to raft is between October and February. The route has forest cover on both sides, which gives it a calm and serene look. You could also get to swim, but should never miss the Horn Bills and the Kingfishers along the route. After all the splashing and screaming in the river we were on our way to explore Dandeli town and binge on some food - a sumptuous lunch in one of the local restaurant. We just had a little time to walk around the town and reach the camp and pack-up. As we drove to the railway station to head back to Bangalore, promised ourselves that we would come back soon. Places to see if you have time or an extra day are Kavala Caves and Cintheri Rocks a 300 Ft rock face.